Hookit is pleased to announce the expansion of its partnership with TransWorld Business. Today, the all-new Hookit Athlete Index is being released that tracks top athletes’ digital exposure and engagement. Every month the top 10 athletes in motocross, surf, skate, snow and BMX will be announced helping build on the consumer magazine data provided in the TransWorld Exposure-Meter. Every day Hookit tracks and measures key metrics such as: followers, likes, comments, mentions and re-tweets on Twitter, Instagram, Facebook and Hookit. Points are awarded for every interaction and broken into two categories for each site, Exposure and Engagement. Moving forward Hookit’s proprietary system will be used to quantify these metrics and report to the industry for the first time ever. “We couldn’t be more pumped to partner with TransWorld on this program,” said Scott Tilton, CEO of Hookit. “I’ve always been fascinated with the TransWorld Exposure-Meter and its power to help athletes quantify their print exposure and value within the industry. Our new Athlete Index allows athletes, fans, brands and the industry to follow in real time, the influence of athletes across the constantly changing and complex world of digital media.” “As the media landscape continues to evolve, we’re excited to push the Exposure-Meter into the social realm in conjunction with Hookit. The new Athlete Index allows us not only to track which athletes are getting the most hype in the social universe, but also to see who is doing the best job promoting themselves,” said Mike Lewis, Editor in Chief, TransWorld Business. “This new feature will give brands a multi-faceted look at their teams, both in traditional print Exposure-Meter coverage, and now on Hookit, Facebook, Twitter, and Instagram. The Athlete Index also provides fans and athletes with a more comprehensive look at what’s trending in action sports in a realm that they can help influence. And this is just the beginning.” For a complete list of athlete stats and rankings, Athletes, agents, brands and team managers are encouraged to contact Hookit to verify their athletes are being indexed. For more information, contact us at 888.874.3374 ext. 133 or athleteindex@hookit.com. 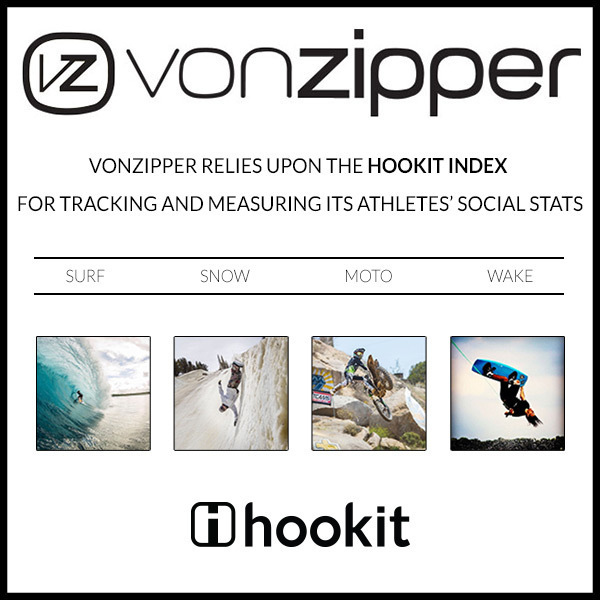 About Hookit Hookit is the most powerful digital marketing platform for action sports. Monster Energy, Dunlop, SPY, GoPro, Recon Tour, Jeremy McGrath, Aaron Gwin, Ryan Guettler and over a million other athletes, brands, spots, events and media partners use Hookit. We exist to support the athletes by plugging them into our growing network. Join the Movement — find Hookit on your phone or www.hookit.com. About TransWorld Business TransWorld Business is the leader in board-sports news and information. As the voice of its industry, it is dedicated to developing the skate, surf and snowboarding markets through thought-provoking analysis of news and trends. High-quality journalism and reliable hard data have established the title as a “must read” for decision-makers who shape the world of action sports. Its world-famous EXPOSUREmeter, regarded as the ultimate source for determining athlete media exposure, is so trusted that it’s used by marketing directors to structure contracts and determine incentives. TransWorld Business is the place to find information on the people, products and issues that are important right now. It’s also an unmatched resource for essential sales numbers, and it’s the perfect multimedia forum to constructively address important industry topics. Everyone — retailers, manufacturers, athletes, agents and reps — relies on TransWorld Business to find out not only what’s going on, but what it means to them.